Drilling Machine Manufacturer - Chen Fwa Industrial Co.
Chen Fwa Industrial Co. is an experienced and professional drilling machine manufacturer in Taiwan. The quality of the equipment is also reputed in the industry. The drilling equipment use a drill tool to cut the edge, and the cutting tool is held in the drill press and fed into the work at different speed. As a drilling machine manufacturer, we know how to deal with the problems that may happen while the machine is working, and we also have proper solution to help you with. 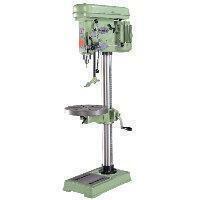 Since the drilling equipment is one of the most important machine in the industry, we serve you only the best! If you are interested in our products, please do not hesitate and contact us today for more information on our tapping and drilling machine! Adopt reducing speed equipment , with high torgue at low speed ,and high ; low speed can be changed easily.